Data locality: Environments can be created in different regions and they're bound to that geographic location. When you create a flow in an environment, that flow is routed to all datacenters in that geographic location. This also provides a performance benefit. If your users are in Europe, create and use the environment in the Europe region. If your users are in the United States, create and use the environment in the U.S. If you delete the environment, then all flows within that environment are also deleted. This applies to any items you create in that environment, including connections, gateways, PowerApps, and more. Data loss prevention: As an Administrator, you don't want flows that get data from an internal location (such as OneDrive for Business or a SharePoint list that contains salary information), and then post that data publicly (such as to Twitter). Use data loss prevention to control which services can share data within your Microsoft Flow deployment. For example, you can add the SharePoint and OneDrive for Business services to a business data only policy. Any flows created in this environment can use SharePoint and OneDrive for Business services. However, they won't be able to share data with other services that aren't included in the business data only policy. Data loss prevention is available with some license skus, including the P2 license. Isolation boundary for all resources: Any flows, gateways, connections, custom connectors, and so on reside in a specific environment. They don't exist in any other environments. Insert data into an Excel file, and store the Excel file in a cloud storage account, such as OneDrive. Create a SQL Database, and then store your data in it. Use the Common Data Service to store your data. Every environment can have a maximum of one database for your flows in the Common Data Service. Access to the Common Data Service depends on the license you've purchased; the Common Data Service isn't included with the Free license. Although environments provide many benefits, they also introduce new limitations. The fact that environments are an isolation boundary means that you can never have resources that reference resources across environments. For example, you may not create a custom connector in one environment and then create a flow that uses that custom connector in a different environment. The Default environment is shared by all users and any user can create flows in the Default environment. If you're a Preview user, all existing flows reside in the default environment. A Preview user is someone who was using Microsoft Flow before its release to General Availability (GA). Go to admin.flow.microsoft.com, and sign-in with your work account. Environment Name Enter the name of your environment, such as Human Resources, or Europe flows. Region Choose the location to host your environment. For the best performance, use a region closest to your users. Environment Type Choose an environment type based upon your license: Production or Trial. You now have an option to Create database or Skip. If you choose to Create Database, you will be prompted for a Currency and Language for the Database. In addition, you can also choose to have sample apps and data deployed. You can now add users to the environment. Select an environment to open its properties. A Maker can create new resources such as flows, data connections, and gateways in an environment. A user doesn't need to be a Maker to edit resources in an environment. Each Maker determines who can edit her or his resources by granting permissions to users who aren't environment Makers. An Admin can create data loss prevention policies and perform other administrative tasks, such as create environments, add users to environments, and assign admin/maker privileges. 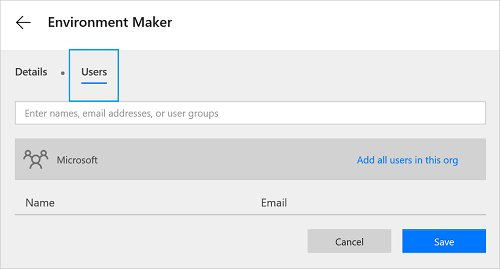 Enter a name, email address, or user group that you'd like to give the Maker role. Any existing roles are listed, including the options to edit or delete the role. Select New role to create a new role. You'll see all existing permission sets and options to edit or delete roles. Select New permission set to create a new permission set. If you did choose to Create Database, to store your data, this database is part of the Common Data Service. When you click on the Security tab you will be prompted to navigate to the Dynamics 365 instance management center where role-based security can be applied. Select the user from the list of users in the environment / instance. 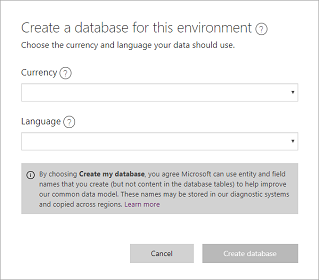 Users or groups assigned to these environment roles are not automatically given access to the environment’s database (if it exists) and must be given access separately by a Database owner. The ability to create and modify a database schema and to connect to the data stored within a database that is provisioned in your environment is controlled by the database's user roles and permission sets. 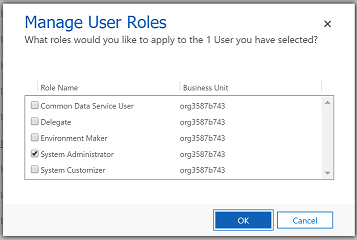 You can manage the user roles and permission sets for your environment's database from the User roles and Permission sets section of the Security tab. Can I move a flow between environments? Yes, flows can be exported from one environment and imported into another environment. Which license includes the Common Data Service? Only Microsoft PowerApps Plan 2 includes rights to create databases with the Common Data Service. However, all paid plans (Microsoft Flow plans 1 and 2, and Microsoft PowerApps plans 1 and 2) have the rights to use the Common Data Service. Choose a plan that's right for you by visiting the Microsoft Flow pricing page. See the Billing questions document for answers to frequently asked questions about billing. Can the Common Data Service be used outside of an environment? No. The Common Data Service requires an environment. Read more about it. 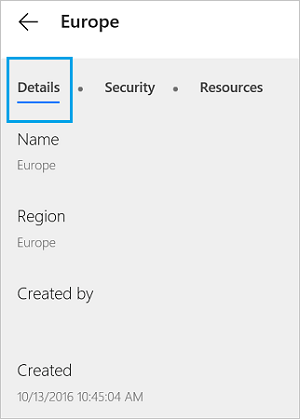 What regions include Microsoft Flow? 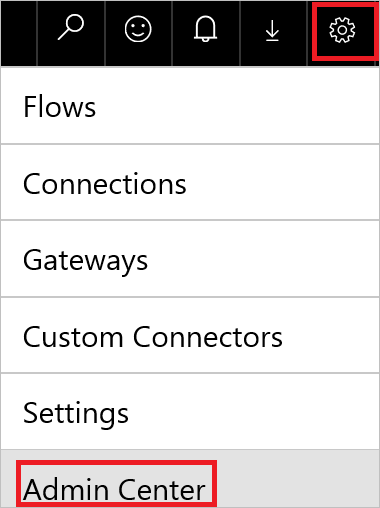 Microsoft Flow supports most regions that Office 365 supports, see the regions overview for more details. What's needed to create my own custom environment? 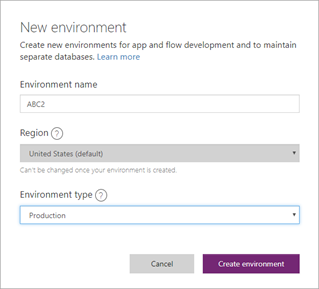 All users with the Microsoft Flow Plan 2 license can create their own environments. All Microsoft Flow users can use environments created by Plan 2 administrators, but they cannot create their own environments.